Sabrina Rabin sprints for second base. Rabin finished her Northwestern career second in program history in runs scored. “Love Runs Out” isn’t a bad walk-up song for Sabrina Rabin. But perhaps “Born to Run” would be more fitting. 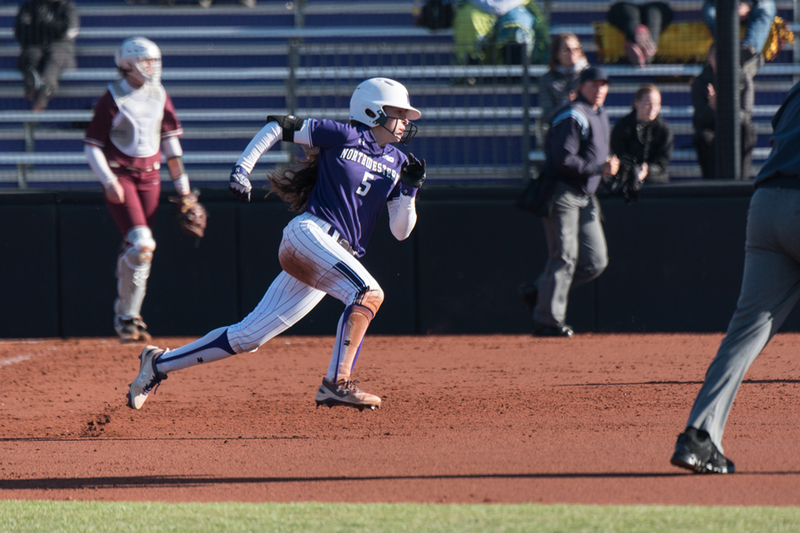 The senior center fielder has made an impact with her speed since the day she stepped on Northwestern’s campus, and she hasn’t stopped running since. 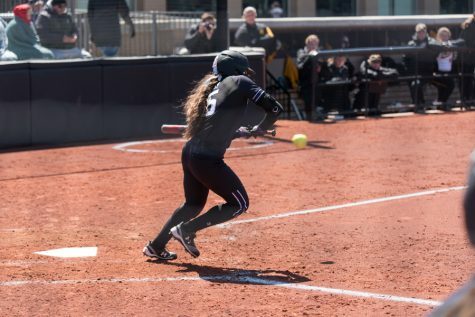 Rabin ended her college career last weekend ranked second in program history in stolen bases, second in runs scored, third in hits and fourth in batting average. But it wasn’t always smooth sailing for the Wildcats’ speedy leadoff hitter. In fact, a major change in Rabin’s approach at the plate helped her get to where she is today. Rabin grew up in St. Charles, Illinois, an outer western suburb of Chicago. When her family moved there, all the recreational leagues were full, so Rabin’s mother suggested she join a travel team. Rabin eventually changed travel teams, playing three years for the Illinois Chill. Her game improved steadily, as did her speed. Batting left-handed helped Rabin develop into a slapper who could beat out grounders to the infield. Rabin started coming to NU softball camps at age 12, where she first met coach Kate Drohan and her top assistant and twin sister, Caryl Drohan. The coaches helped Rabin continue to develop her game, so that by the time she enrolled in St. Charles North High School, she was already a star in the making. At St. Charles North, she excelled both at the plate and in the circle. As a junior in 2013, Rabin hit .534 while stealing 35 bases, and also went 18-4 as a pitcher with a 1.49 ERA. She earned high praise from the local media that season, and the next year was No. 47 in the Student Sports Inc. ranking of the top 100 senior softball players in the country. Not surprisingly, Rabin was also a track star in high school, and set the school indoor records in the 50- and 55-meter distances. Her high school softball coach, Tom Poulin, said Rabin’s impact is still being felt on their program today. Rabin kept coming to Evanston for the camps, and became more connected with NU’s coaches. The Drohans identified her early on as a young player with a lot of potential, and Rabin committed to NU as a high school sophomore. Sabrina Rabin fields a hit at the fence during her 2015 freshman season. Rabin’s defensive abilities were an underrated part of her game. Rabin was an instant star upon arriving at NU. She started every game in her 2015 freshman campaign, hitting .394, scoring 50 runs and stealing 28 bases. Her speed made an impact beyond stolen bases as well — in a game at Notre Dame, for example, Rabin scored on a sacrifice fly from second base. She was recognized for her accomplishments by being named Big Ten Freshman of the Year. Rabin’s career at NU was marked by incredible consistency. Over the next three years, she would prove that her outstanding freshman season was no fluke. Rabin got many of her hits by slapping the ball to the left side of the infield, and simply using her speed to beat the throw. Her career-high 10 extra-base hits her senior year, however, proved Rabin is also capable of driving the ball into the outfield. Though Rabin’s speed captures attention on the bases, it is a huge asset in the outfield as well. She made just seven errors in her college career and frequently makes difficult plays in center field look easy. Her defense is an underrated part of her game but came to the forefront several times, most notably April 27 this year, when she tracked down a long fly ball in deep center to help preserve a win over Iowa. Rabin capped her remarkable career with a fantastic 2018 season. She started every game in center field, and led off in every game but one, when Drohan experimented with the lineup and had her hitting second. She got off to a slow start, at least by her standards, hitting just .242 after two weeks of play. But she went on a tear after that, going 8-for-14 at the Mary Nutter Collegiate Classic and not looking back. Rabin had a 13-game hitting streak from March 4 until March 30, with nine multi-hit games during that stretch. Sabrina Rabin bunts towards third base. Beating out slap hits by outrunning the throw to first led to many hits throughout Rabin’s four years as a starter. Drohan said Rabin’s versatility has helped her to be a catalyst for NU’s offense. Rabin led the Big Ten in steals this season, finished second in runs scored and third in hits. She is one of only 12 players in program history to be named to an all-conference team all four years. 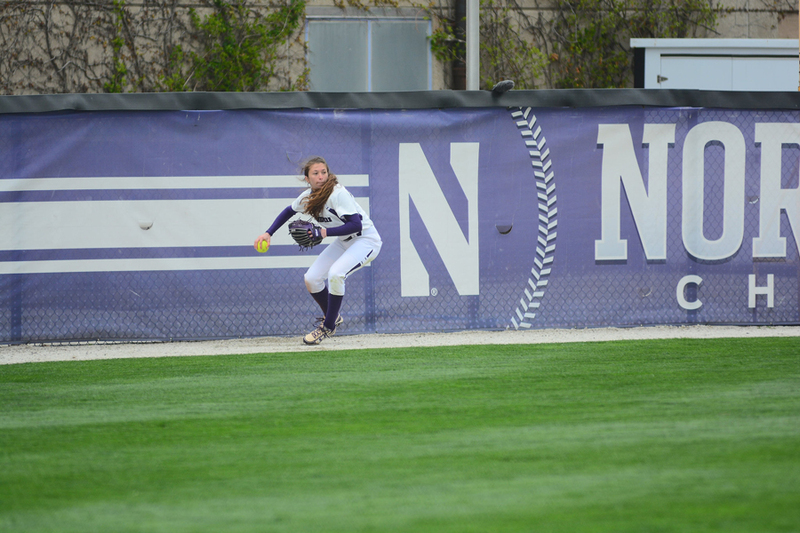 Her on-base skills at the top of the lineup helped NU improve from 25 wins last season to 38 this year. The Cats advanced to the championship game of both the Big Ten Tournament and the NCAA Athens Regional. Throughout her time at NU, Rabin never lost her work ethic and has always been looking to improve, which has helped her become one of the program’s most decorated players.